Rollout rubber flooring is suitable for both interior and exterior applications and is ideal for surfacing areas that require resilience, sound absorption, spike protection and traction. 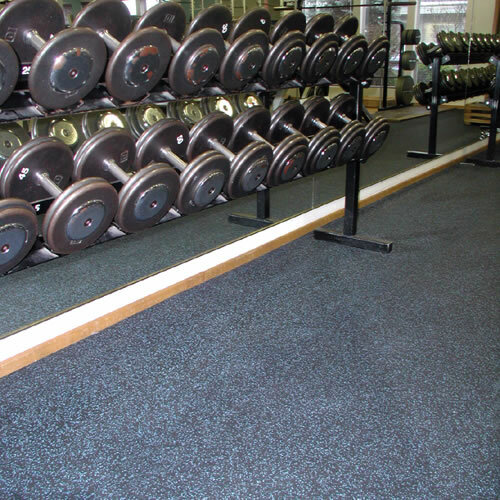 AmericanFitness.net offers rollout rubber flooring in a variety of sizes and colors to accommodate whatever size room you need to cover. Standard rubber flooring comes in 4 feet wide rolls and lengths of 25 feet to 100 feet. If you require a special width or length, let us know and we will generate a custom quote to meet your needs. Rollout rubber flooring is easy to install and can be easily cut to accommodate any room size and obstacles that may be in way, such as a support beam in the middle of gym. Rolls are also great for temporary walkways to protect from cleat marks and other damage to your regular flooring or walkway material. Just roll it out when you need it, and roll it back up for easy storage when you don't. Whether you are looking for rubber gym flooring for underneath your home gym or for your entire facility, we have you covered.